Losses are mounting for small businesses at the Calgary International Airport as enormous ash cloud from an Icelandic volcano forced the cancellation of flights to and from Europe again Monday. 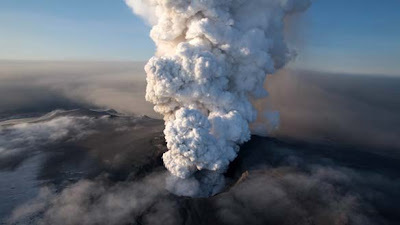 The volcano erupted on April 14, spewing a dense cloud of ash which is rough and can damage jet engines. Airports all over northern Europe have grounded flights since last week and North American airlines have cancelled transatlantic service also. With no one lining up to fly to London or Frankfurt from Calgary, entrepreneurs who function in and around the airport are losing money. It's actually quiet than before. Used to I have almost 700 or 800 in sales since 12 or one o'clock. Today I have just $18, said Jaspreet Garcha, who operates a shop inside the airport. Taxi driver Khalid Naeem said he currently waits at least three hours between passengers at the airport — almost twice as long as usual. We are extremely slow over here in fact. Usually we can get five, six fares, so it's my third fare. After that I think I have no time to come back for another one, he said, estimating that 50% of his income has dried up. European Union transport ministers agreed Monday to partially reopen the airspace. It will be separated into three zones based on danger levels. One zone will be open to all flights, a "caution zone" will be open to a few flights, and a third zone will be closed to all flights. Five flights per day to Europe from Calgary have been cancelled, as well as those operated by Air Canada, British Airways, Lufthansa, KLM, Air Transat and Thomas Cook Airlines, said airport spokeswoman Jody Moseley.